Yes, I am a Malaysian food blogger (or as recently coined, a Malaysian FLogger... haha). That said, it's difficult for me to truly judge the quality of a steak especially in this case (since I cannot afford to and have never dined at Prime @ Le Meridian**)... but 2 of my friends made me promise that I would post this up (since they are too lazy to maintain food blogs of their own. :P). Beware of the waiters/ waitresses at Prime. It's not that the ambience and food isn't nice there (although it is super overpriced unless you have the Starwood Card), but you must not leave it to the wait staff to adjust the portion of the special cuts of steak (that are priced at hundreds of RM per KG btw) because they will tend to take advantage of your trust. No kidding - they were served that size of steak each. This happened to 2 of my friends on separate occasions***, one of which suffered more financially and also tastewise because she had Wagyu which is super rich and jelak-inducing after >100g. Also, if you were wondering - Yes, both my friends had explicitly voiced their concerns over the potential sizing of the portions but were told by the waiter/ waitress at the time, " Don't worry, it will be just nice for the both of you ". always order the size u r comfy with..
in that case, yes..half a kg shud b just right haha..
stewpid waitress... we're chinese! and while we do eat almost anything and everything, it doesn't mean we can eat the whole thing! by the way, I'm sure they are directed by the management to do that! once u place trust on someone else.. it's just like on chopping board. Really?? But if that steak can feed (rightfully) about 5 ppl then it's possible to eat for around 150++ bucks, isn't it? But that sort of behaviour is so not classy worr... It's supposed to be a high class hotel right?? We were actually going to go for the wagyu but it was sold out so we had the black angus prime rib..
and my meal came up to i think 500+ before the discount. There are steaks below $100 as they serve a very very large variety of cuts and origin. 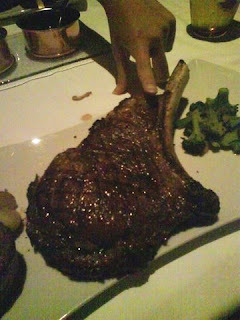 I'm actually a fan.. lol just it's the first time I encountered such a large slab of beef. No idea... but it's really bad behaviour on their end, don't you think? Prime is a rip off. the waitresses always encourage you to order more when they know very well that being ladies, we sure can't finish that big slab of meat! Once I had dinner with 9 friends and the bill came up to RM8k but with some wines la... cut throat! Hope you enjoy the food there - Do share your experience if you can.